Tags: Daniele Daniele, G.L. Jaguar, Katie Alice Greer, Priests, Sister Polygon Records, The Seduction of Kansas, Washington D.C. The Seduction of Kansas references some beloved American icons, like Superman and Dorothy from The Wizard of Oz, as well as some truly reprehensible characters. 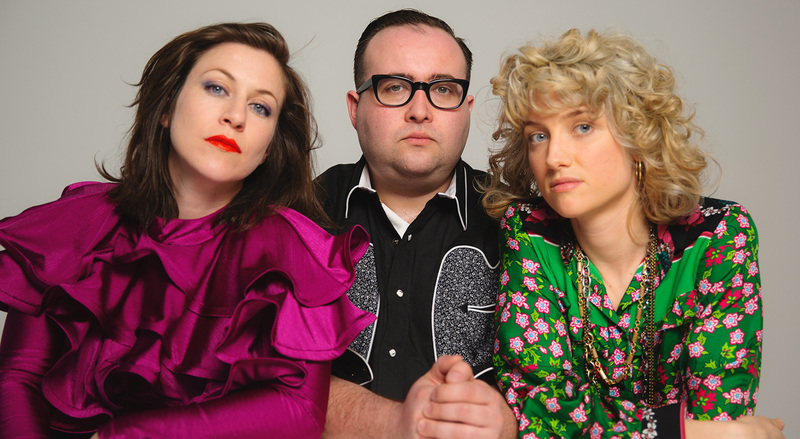 Priests’ highly danceable post-punk has satirized product placement, criticized virulent consumerism, denounced institutional abuses of power, and probed generational apathy. And on the title track from their forthcoming second album, The Seduction of Kansas, the Washington, D.C. band conjures a grim version of America. Greer, alongside drummer Daniele Daniele and guitarist G.L. Jaguar, looks a little out of place among advertisements for a goblet of amber nectar called the Mucho LIT. The record takes its title from What’s the Matter With Kansas?, a 2004 book by the political analyst Thomas Frank that explains the state’s shift from its liberal origins to rigid conservatism as a reflection of greater American ideological shifts. The characters that populate the record’s flyover sprawl boast vast superiority complexes and vices, from a man who believes that being the Savior’s son gives him license to destroy the world, to self-absorbed screen addicts, to the notoriously corrupt former Texas congressman Charlie Wilson. Two years ago, Priests broke through with Nothing Feels Natural, a full-length debut that cast a critical gaze upon modern society at an especially pivotal moment in American history. The record’s release coincided with Donald Trump’s inauguration, and suddenly, lyrics about “a puppet show in which you’re made to feel like you participate” felt all the more urgent. Though the album blended the band’s typically restless rock barrages with traces of jazz, surf, and country, most appraisals of Nothing Feels Natural deemed Priests a “political punk band,” a label they have long resented.